The new robust dive computer in a rugged steel casing, refined Suunto D6i Novo Zulu is a watch-sized dive computer for those who take their diving seriously. 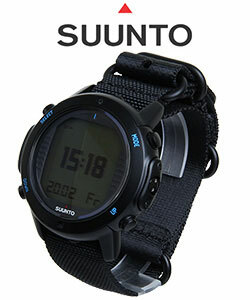 Including a tilt-compensated digital compass and wireless air integration, Suunto D6i is in favor with professional divers. The extremely durable Zulu strap, originally designed for military use, can take heavy-duty wear and tear and is widely trusted by professional divers. Easy to adjust on wetsuit but also most comfortable around wrist when not diving.